Come on a tour that escorts you to four or five spots ideal for indulging in the pleasures of the vine. You’re in the Art Nouveau district, one of the loveliest parts of Riga. You’ve spent a few hours sightseeing around streets full of splendid Art Nouveau architecture, such as Alberta iela, and visited the Art Nouveau Riga store and information center at the corner of Alberta and Strelnieku. Your legs are tired, your neck is sore from craning upward, and you need a drink. You need something more sophisticated and more warming than a beer, something less immediate than vodka… A glass of fine wine? No problem. This part of the Latvian capital has some calming places to enjoy a glass of wine or three. Elizabetes Street, itself a prime Art Nouveau location, connects the dots on this close-of-the-day wine tour. Just a block away from Alberta is Vina Studija (Elizabetes 10, tel. 6728 3205), a café and wine shop with a welcoming, bright, efficient and uncluttered atmosphere. 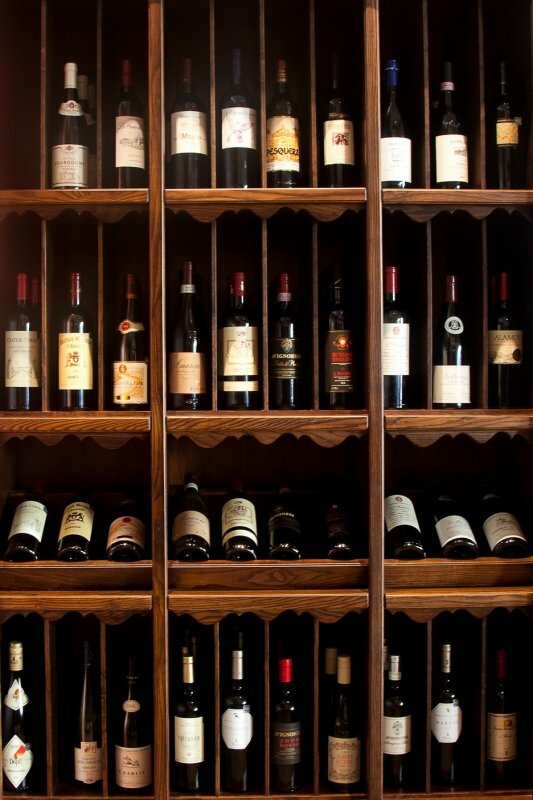 Select from the wine list by the glass, carafe or bottle, or choose any bottle on display in the store and drink on the spot for a service fee of €5.70. Try the ruby red Ad Astra, a blend of different grapes, from the centuries-old Fattoria Nittardi wine estate in Tuscany near Florence. Its aggressive taste lasts long in the mouth – at least until the next stop. Alternatively, soothe your stomach before the tour with a glass of peppermint tea. There’s light food – no heavy fine dining – to go with the wine, for example a warm baguette with parma or salmon (€4). For snacking with a group, opt for the affettati misti (€9), traditionally a variety of antipasti that launches a festive Italian meal. Here, it consists of prosciutto, salami, Belmagro and other meats, crumbled Grana Padano cheese, orange marmalade and sundried tomatoes. If you don’t mind an early start to the tour, there’s another reason for beginning at Vina Studija. On Sundays between 11:00 and 14:00, all glasses of wine served at the bar are half price. If you happen to be alone on your wine tour – at least at the start as you never know who you’ll meet along the way – Vina Studija has free wi-fi. Exit from there and turn right to walk along Elizabetes, preferably on the other side of this busy one-way street. This part of Elizabetes boasts one of Riga’s most extroverted Art Nouveau facades. The pioneering Russian filmmaker Sergei Eisenstein was only a toddler when his father Mikhail designed the visually stunning Elizabetes iela 10b (1903) with its elongated faces, figures and blue glazed bricks. Cross to the other side of Elizabetes at the teeming crossroads with Valdemara and stroll beside Esplanade Park, a leafy open space that contains the austere National Art Museum on the right and the onion-domed Nativity of Christ Cathedral at the far end. You’ll pass two monuments on the edge of the park. The first is to Oskars Kalpaks, an army captain who, following distinguished service in the Russian army against the Germans in World War I, enlisted with the Latvian Ministry of Defence in 1918 when Latvia declared its independence. Becoming colonel, he commandeered the Latvian army to fight back the Bolsheviks, but was killed in action in March 1919. Standing opposite the towering Radisson SAS Latvija Hotel is a monument to Mikhail Barclay de Tolly, the famous Baltic-German Russian field marshal who repelled Napoleon’s army in 1812. Cross Elizabetes again and find the D’Vine wine bar (Elizabetes 55, tel. 6777 2217) at the top of a flight of metal steps to the right. While wine can certainly be enjoyed in the trendy 22nd-floor Skyline Bar with its panoramic views, especially as the sun sets over the city, wine lovers will also be delighted by a trip to the sophisticated and strangely oblong-shaped D’vine, which offers more than 120 wines, tasty tapas and main courses. Sitting there it feels like you’re floating in a brightly colored metallic boat above the city. Or maybe it’s just the wine. If it’s empty, stick around – it tends to fill up at around 20:00. Believe it or not, this is the oldest wine bar in Riga, five years old this year. The wines and tapas live up to the bar’s name. One of Chile’s best estates, the French-owned Casa Lapostolle, is represented by its magnificently luscious Sauvignon Blanc (2006; €59). For something more gluggable, The Last Ditch (2008; €37), an enjoyable yellow and citrusy Viognier from the Adelaide Hills, goes well with practically any food. The upscale tapas range from spicy chorizo in cider sauce to quail egg baskets. But this could also be the spot to settle down for a full-on evening meal. The friendly fluent-in-English serving staff can help to locate the right wines to accompany dishes like roasted fillet of beef with red wine sauce, baked potato, sauteed spinach and roasted garlic cream (€17.80) and seafood paella (€7). So by now it should be well into the evening. Continue further along Elizabetes and you’ll reach another excellent wine-and-tapas bar located in front of one of the few remaining non-multiplex cinemas, Kino Riga, recently given back its prewar name Splendid Palace. Tinto (Elizabetes 61, tel. 6728 9085) combines elements of restaurant, tapas bar and wine shop to attract film-lovers, the laid-back and the intellectual. Here are just a few of the mouthwatering tapas: duck pate with onion marmalade; tartar of salmon with violet onion and parsley; lightly pickled asparagus with fried Brie topping; goat cheese with honey glaze and rocket. All are priced at €0.70 or €1.40. Bread for the tapas is baked in-house. Choose your plonk – a bottle of Chilean cabernet sauvignon, say, for €16, or an excellent New Zealand pinot noir for €24. Or, best of all, a hearty, black-fruit flavored 2006 Quinta do Pego Grande Reserva from Portugal for just under €30. Make sure this one breathes a bit before you drink. A few steps further on is Garage (Elizabetes 83/85, tel. 2662 8833), a friendly wine bar and restaurant found to the right of the 5-star Hotel Bergs. Motor-related paraphernalia is artistically arranged on the walls and it’s often full of chatter and laughter in the evenings. It combines slow-food produce with Latvia’s best beef cuts or fresh seafood shipped in daily. One of Latvia’s premier sommeliers assisted in compiling a list of around 16 fine wines that can be ordered by the glass (€2.90-5.75). Now you should be thinking how to stagger back to your hotel. If it’s in Old Riga, why not take it one last splashy-splashy along the way. Fortas (Aspazijas 32 tel. 6722 7270) is a relaxed and unpretentious spot to put a finishing touch to the evening. There’s a packed wine list. Or have a shot of vodka to put a touch of finality to the night. You only live once. assistance of a thoroughly chosen daily devotional on the knowledgeable.